The aim of this study was to determine the influence of different shoe-pedal interfaces and of an active pulling-up action during the upstroke phase on the pedalling technique. Eight elite cyclists (C) and seven non-cyclists (NC) performed three different bouts at 90 rev · min−1 and 60 % of their maximal aerobic power. They pedalled with single pedals (PED), with clipless pedals (CLIP) and with a pedal force feedback (CLIPFBACK) where subjects were asked to pull up on the pedal during the upstroke. There was no significant difference for pedalling effectiveness, net mechanical efficiency (NE) and muscular activity between PED and CLIP. When compared to CLIP, CLIPFBACK resulted in a significant increase in pedalling effectiveness during upstroke (86 % for C and 57 % NC, respectively), as well as higher biceps femoris and tibialis anterior muscle activity (p < 0.001). However, NE was significantly reduced (p < 0.008) with 9 % and 3.3 % reduction for C and NC, respectively. Consequently, shoe-pedal interface (PED vs. CLIP) did not significantly influence cycling technique during submaximal exercise. 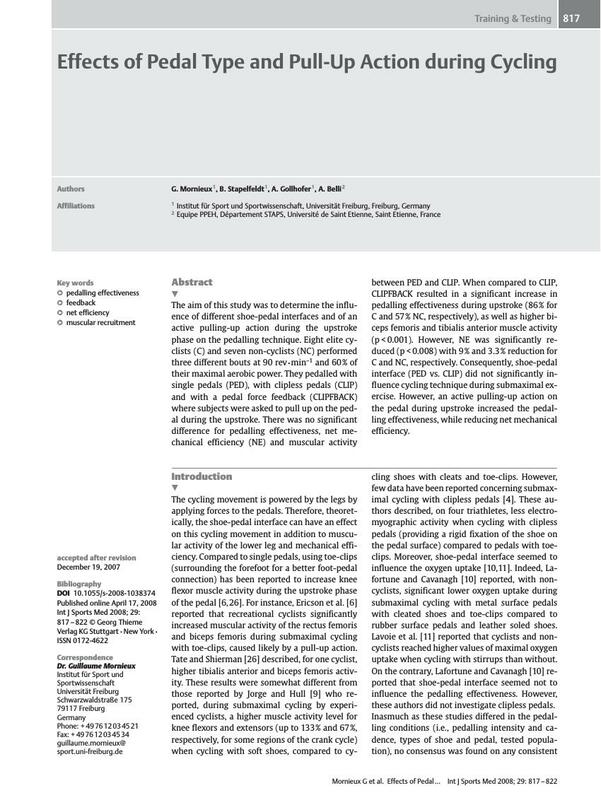 However, an active pulling-up action on the pedal during upstroke increased the pedalling effectiveness, while reducing net mechanical efficiency.